Normally we will using Google search engine for getting results if facing some problem.Sometimes we will using some special syntaxes to get the searching results correctly that we wanted.Are you familiar with these special syntaxes such as intitle,link,filetype,info,etc ?Unless you are using these special syntaxes all the time,if not you will be forget in the future.Now you not need to remember this,just visit this one stop solution Google advance search website – Soople . Soople website includes a specify Google search of music, movies, books, video search, keyword search, Offices documents and PDF files, calculators, site backlinks,etc. 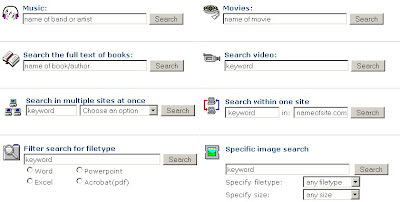 These features were refined to a small search window. Furthermore,the calculator web page let’s you all kind of simple and advanced calculation.If you forgot bring the calculator along with you,just using this.